Lagavulin is a distillery on the island of Islay and like the majority of distilleries on the island, Lagavulin produces smoky and complex whiskies. It is renowned within whisky circles as being one of the best examples of a smoky whisky. The distillery is located on the south coast of Islay, close to the town of Port Ellen, and was established in 1816. It is currently owned by drinks giant Diageo and is one of their smaller capacity distilleries, producing around two million litres of whisky per year. 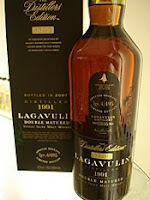 Lagavulin is released as a limited core range - a 12 years old at cask strength, a 16 years old and this Distiller's Edition. By doing this, they concentrate on what they do well and maintain their very high standards. the 16 years old is the Islay representative in Diageo's 'Classic Malts' series and is the most popular bottling from the distillery. It is the third highest selling smoky malt whisky behind the Laphroaig 10 years old and Bowmore 12 years old. This 'Distiller's Edition' is also released at 16 years of age but for the last two years it is matured in a Pedro Ximinez sherry cask. The colour is a dark, golden amber and the nose is a complex mix of sweetness coming from the sherry influence and the peat. Pedro Ximinez is a very sweet, dark and thick sherry and this means that it is not overpowered by the intense, pungent smokiness of the Lagavulin spirit. On the palate this is liquid gold. The earthy and bonfire smoke hits you first but then the rich, sweet dried fruits (imagine raisins and candied citrus peel) come through. There is further sweetness that reminded me of molasses or treacle and also a slightly salty note (think of seaweed). The finish is long, rich, smoky and gorgeous with a slight dryness and bitterness (imagine iodine, a classic south Islay whisky characteristic). This is a great whisky and is richer and sweeter than the regular 16 years old bottling. It would be a very good after dinner whisky and would go well with a strong or blue cheese. The price is higher also, as Pedro Ximinez casks are very expensive to buy and as it is a limited release. It is available from specialist retailers only and should cost between £45-55. Bruichladdich is located on the western Scottish island of Islay, the spiritual home of the world's smoky whiskies. The distillery was re-opened in 2000 by a consortium of business men led by Mark Reynier, whose background was primarily in the wine trade. They set out to buck the trend of the traditional whisky world by innovating and experimenting with different processes in order to introduce new and exciting products in to the market place. The whisky making process at Bruichladdich remains extremely traditional, with much of the original equipment from when the distillery was founded in 1881 still being used. This is combined with the manual skills of the distillery workers but the major innovation at Bruichladdich comes after production. Some traditionalists disapprove of their use of different casks for maturation or the number of special releases that they put out, but Bruichladdich's aim is to expand the boundaries of whisky and entice new people to try their product. This X4 is one such special release. X4 is new make spirit that has come straight off the still and is then lowered from 92% ABV to 50% and bottled with no cask maturation. It cannot legally be called whisky, as that requires at least three years of maturation. the result is similar to a vodka or eaux de vie. 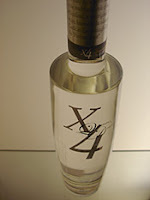 Another difference is that it has been distilled four times (hence the name X4). The spirit is clear and on the nose you are hit with a fresh fruity note. There are lots of pears, apples and white grapes with a hint of citrus (think of lemons), and it reminded me very much of a grappa or a mezcal. On the palate, X4 feels creamy (almost syrupy) and that fresh fruit and citrus is present again with lots of grain and cereal coming through. The finish is fairly long, pungent and not particularly pleasant in my opinion. Having tried some new make spirits before, X4 was certainly a lot smoother than I imagined it would be but it would certainly be hard work to drink much of it straight. It would be better with a mixer or in a cocktail. This is limited at present to around 1000 bottles with another batch planned and should cost between £35-40. 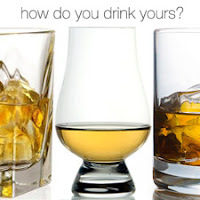 Here at Whisky For Everyone, we have set up our first readers poll. This has been done in order to try and find out how everyone of our readers around the globe drinks their whisky. This will help us when we are planning the writing of new articles. In addition, if you have any further comments about this or any articles or other ideas that you would like to see on the blog, then please leave us a comment or email us at whiskyforeveryone@gmail.com. Just go to the side navigation bar to register your vote now. Thank you. Bruichladdich (pronounced brook-laddie) is based on the island of Islay, which lies off the west coast of Scotland. Islay is the traditional home of the world's smoky whiskies but Bruichladdich's distillery style is in contrast to this , being quite light and fresh. It is one of Scotland's most innovative distilleries and one of very few that are independently owned in scotland. Since being taken over by a group of entrepreneurs in 2000, Bruichladdich has been very experimental with it's whisky production and release programme. They are known for maturing their whisky in non traditional wine and dessert wine casks. A number of whisky purists do not agree with this approach, but by experimenting Bruichladdich's aim is to try and introduce new people to whisky and this can only be a good thing. The purists believe that whisky should be matured in the traditional casks of bourbon, sherry and refill whisky. Bruichladdich's innovative range is extensive and they are always updating it with new releases. 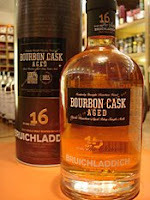 Here they have gone back to basics and this 16 years old has been matured in bourbon casks. Some of these are made from fresh oak and the influence of this is evident in the nose - it is full of vanilla. On the palate, this is rich, creamy and feels full bodied in the mouth. The overpowering characteristic is vanilla but other fresh fruit (imagine crisp green pears and apples) and some warming spices (like nutmeg and cinnamon) come battling through. There is a slight woody bitterness present throughout. The finish is long and rich with the vanilla and spices prominent again. This whisky was enjoyable but was on the edge of having too much wood cask influence, for my own personal taste. It would be a good choice if you like big, creamy and full bodied whiskies. Chris, my work colleague, described it as 'like licking a piece of oak'. A bottle should cost between £40-45 and is a limited release, restricted to independent retailers only. The name of Stronachie has not been around in the whisky world for a significant length of time. The original distillery of this name was built during the 1890s in a remote part of Perthshire and during the early 20th century was distributed by an independent bottling company called Dewar Rattray. However, following the massive slump in the whisky industry during and after the First World War, many distilleries were forced to close. The first to go were normally those in the remotest locations. Stronachie was closed in 1930 and dismantled, so money could be raised from selling the distillery equipment. The story of name's revival starts in 2002 when Dewar Rattray (now A.D. Rattray) bought a bottle of Stronachie from 1904 at auction. They decided to try and recreate a whisky from this long lost distillery and distribute it once again. A sample was taken from the 1904 bottle and A.D. Rattray tried to link to characteristics to a currently operating distillery. The distillery was Benrinnes in Speyside and this now supplies the whisky that goes into Stronachie. This 12 years old actually has some older whisky from the same distillery present, so as to give a closer representation of the 1904 bottling. The different ages of whisky are given time to marry together in a cask and the result is very good. The colour is a golden amber and the nose is full of sweet dried fruits (think of raisins and sultanas), malted barley and something nutty. There is also a lovely floral note (imagine heather) and a whiff of earthy smoke in the background. Smokiness is unusual in Speyside or Highland whiskies these days but was common in the late 1800s and early 1900s. On the palate, this is rich with that fruitiness and maltiness, some toffee, warm spices (nutmeg or cinnamon, i think) and that gorgeous smoke backing it all up. The finish is long, sweet, spicy and peaty. This is a very good whisky that is rich, complex and very well rounded. It is easy to drink and would be a good introduction to someone who thinks that they don't like whisky. A great bargain at under £30 and only available in independent retailers.